Your customer database is GOLD. Are you putting your database to work? If you’re not reaching out to previous customers, you are missing valuable opportunities. Good database marketing effectively generates new leads and uncovers older clients who are looking for your product or service again. Could your database provide a stronger ROI? Find out with our FREE Company Database Evaluation! We’ll examine what you have and recommend the best steps for growing your company. 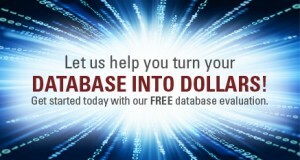 Please fill out this form to get started with a FREE no-obligation Company Database Evaluation. We are serious about privacy and will not share your email address or contact information with anyone. Provide your company database and Continuity Programs will do all the work! Call us at 800-521-0026 to learn more. We never share your database or any of your data with anyone; click here to read our Privacy Statement. A Non-Disclosure Agreement is available upon request.